Cheltenham-based saxophonist Dom Franks links up with classical pianist turned improviser John Law on this engaging and highly listenable collection of originals with the odd (sometimes very odd!) cover featuring two excellent young rhythm section players as well as plenty of accomplished soloing. 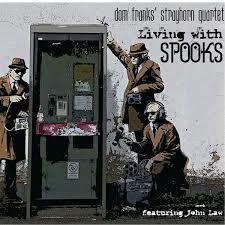 This is Franks’ Strayhorn Quartet’s third album since their formation in 2010. A former winner of the Daily Telegraph Young Jazz Musician competition, the leader plays tenor and occasional limpid soprano saxophone, with a tone that varies from full and funky to light and airy as the mood demands. He writes well too, and the six originals on this ten-track album run a range of moods from the driving opener The Calling to the reflective The Kiss Of The Sun For Pardon, via afrobeat and funky flavours. I was taken with the soprano performance and tone on Granada, with dancing lines combining to give a Spanish tinge. Known for his free improv work, Law provides a fairly straightahead piano role which is notable for creative counter-lines and rich harmonies on six of the tracks. His solo introduction to Granada is probably worth the price of the CD in itself. Franks’ regular keyboardist Alex Steele plays on the remaining tunes, and it’s to his credit that he maintains a consistent feel to the whole collection – the switching of pianists is not immediately obvious to the listener. The covers on the album are an intriguing mix. The eye is immediately drawn to Mr. Men Reloaded, a reworking of the jaunty Mr. Men TV theme originally composed by Tony Hymas. The tune has plenty of harmonic interest, and Strayhorn do it full justice – the waltzing tune is embellished with piano counterpoints, with a brief moment of rhythmic exuberance leading, bravely, into a terrific double bass solo by James Agg. This forms an excellent springboard for the pace to pick up again for a lilting tenor solo. Agg takes several key solos, including unusually a fully arco solo (played with the bow) on the haunting The Kiss Of The Sun For Pardon, showing a high level of musical awareness as well as great skill on both acoustic and electric bass – a man to watch for the future. Young drummer Billy Weir, winner of the 2014 Tony Levin prize for the ‘most swinging drummer’ at Birmingham Conservatoire (and Levin was himself a mightily swinging drummer to celebrate too!) provides a very interesting and varied accompaniment to the proceedings throughout. Very much at home in all styles from fidgeting shuffles to heavy beats, Weir plays key roles in tracks such as Franks’ original Angelique (which fizzes with afrobeat energy) and the spiritual song Didn’t My Lord Deliver Daniel, given a funky take here with nice electric guitar from guest Lee Jones. These musicians are obviously at ease performing together, and it’s no surprise to find that Agg and Weir also appear on Law’s recent CD Re-Creations Volume 1. The title track, Living With Spooks, based none too subtly on the Ghostbusters movie theme originally recorded by Ray Parker Jr, is a fun workout and also gives a connection to the group’s origins in the home town of GCHQ. Taken all in all, this is a well-produced and entertaining collection providing a very satisfying listen with great variety. I can imagine that live performances from the group would also hit the mark with jazz fans and interested bystanders alike.